Harnesses for Chihuahuas and Small Dogs with Matching Bracelet - Superpipapo: In Style with Your Pet! Harness & Bracelet There are 8 products. The rainbow expresses freedom and happiness. 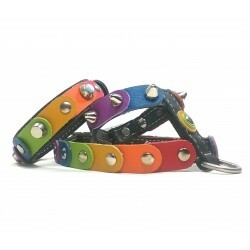 Therefore, this original exclusive leather Rainbow Dog Harness and Bracelet design for dogs and owners that are free and happy and do what they want to do! This luxury dog harness with bracelet is not for each dog or owner. Purple and pink ornaments and a big exclusive leather flower combined with Strass Polaris Stones: could this be your style? 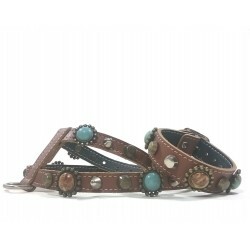 This unique leather harness for Chihuahuas and Xtra Small dogs, as the bracelet, has a stylish design with beautiful nature and turquoise stones Polaris. An unusual Design for both. With this Designer Handmade Leather Chihuahua studded harness with Leopard style Polaris stones and matching bracelet , your Chihuahua or Little Dog Cool and Trendy looking like yourself! With this Designer Handmade Leather studded harness for small dogs and bracelet with red Polaris coral style stones your dog and yourself will be looking cool and trendy! This custom leather harness for the dog and matching bracelet is a happy design with leather patches in various attractive colors green, purple, and pink. Luxury yellow and black leather with originals Polaris stones and ornaments. Original is also the Black Piranha Charm: A Bold combination!